EXTRA-time strikes from Seamus Sharkey and Mark Timlin saw Derry City secure their place in the quarter-final of the EA Sports Cup at the Sligo Showgrounds this evening. After what had been a fairly pedestrian affair throughout normal time, both sides possibly feeling the strains of their weekend league fixtures, scoring chances were at a premium. Peter Hutton, however, will have no complaints having fielded a strong side and the win will certainly put last weekend’s disappointing 3-0 defeat at Turner’s Cross to the back of their minds. Having made two changes from the team which travelled to “Leeside” on Friday - Cillian Morrison came in for Timlin with Sharkey replacing Shaun Kelly - Derry City opened brightly enjoying the glorious sunshine at the Showgrounds. Indeed, the visitors created two chances during the opening 10 minutes when both Anthony Elding and Sharkey went close with headers. However, while Sligo Rovers may have taken time to grow into the game, it was the home lot who created the best scoring chance of the first period. In fact,on the half hour Gerard Doherty had to be alert to stop a shot from John Russell, the keeper getting down low to get a strong right hand behind the ball to deny the Sligo midfielder. And as the game ebbed and flowed Aaron Barry broke forward on the left and while his centre found Patrick McEleney, the Derry striker failed to hit the target from the edge of the box in the 33rd minute. Both sides attempted to move the ball forward after the break and while the quality of the play disappointed on occasions, there was very little between the teams. 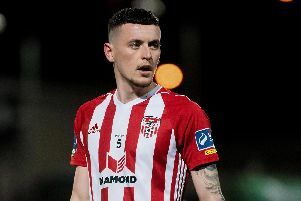 In the 54th minute Seanan Clucas did well to find Barry McNamee but the Ramelton man’s effort was blocked by Sligo left-back, Jake Dykes, son of former Derry captain and manager, Gavin. Sligo went very close again when the impressive Russell smashed another effort on target, this time the ball crashing off the upright and the “Candy Stripes” breathed a sigh of relief. The home side introduced Danny Ledwith for Kevin Devaney in the 75th minute and in his first action of the game, the Sligo player was shown a straight red card following what appeared to be an over-the-top challenge on Derry’s Seanan Clucas who was eventually substituted. Derry powered their way forward during the final minutes with Cillian Morrison forcing Brush into a vital save with an accurate volley. Substitute, Ryan Curran, then began to make an impression during the first period of extra-time when his low shot was saved by Brush before another effort, minutes later was deflected wide at the expense of a corner. And it was from that corner in the 102nd minute that Derry finally broke the deadlock. Full-back, Sharkey, took full advantage of a ‘free’ header, the ball possibly getting a slight deflection off a defender on its way to the net. Using the extra man to good effort and with Sligo players appearing weary, Derry doubled their lead when Timlin, racing forward, cut in from the left to drill the ball low into the far corner in the 113th minute to secure a place in the last eight of the competition. SLIGO ROVERS - Brush, Boylan, Peers (McManus, 83), Folan, Dykes; Beattie, Cawley, Russell, Devaney (Ledwith, 75); Cretaro, Corcoran (Neilsen, 101).